The dystopian border and immigration management game Papers, Please last caught our eye when it rose through Steam's Greenlight service and announced a summer release window. Information about the offbeat indie game continues to sneak across the border, though: the latest is the retail price, which can be pried out of a tight-lipped border guard in a minigame at Papers, Please's official site . 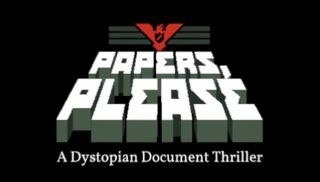 From its thoroughly retro style to its jackbooted approach to PR, Papers, Please is going all-in while exploring the themes of Soviet Union-era dystopia and state-controlled populations. The game's developer, Lucas Pope, told The Verge that he's “attracted to Orwellian communist bureaucracy,” and it shows. Papers, Please will charge you with controlling a crowded checkpoint, where you'll keep out forged passports and bad characters unless they, you know, throw you a little something extra. The game will be available on Steam for (spoilers...for the mini game? I guess?) $10, but you can play get the beta version for free right now.